The following is a quick guide to help you make the right decision when a baby bird is found. Many species of birds such as robins, scrub jays, crows and owls leave the nest and spend as many as 2-5 days on the ground before they can fly. This is a normal and vital part of the young birds' development. While they are on the ground, the birds are cared for and protected by their parents and are taught vital life skills (finding food, identifying predators, flying). Taking these birds into captivity denies them the opportunity to learn skills they will need to survive in the wild. Unless a bird is injured, it is essential to leave them outside to learn from their parents. 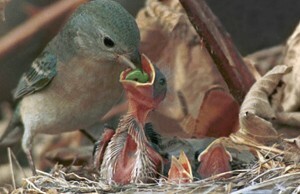 Before taking any baby bird out of the wild, please contact a NJ Wildlife Bird Rehabilitator. See list on Home page. If you are concerned that a bird fell from its nest too early, you may try and return the bird to its nest. If the nest has been destroyed or is unreachable, you may substitute a strawberry basket or small box lined with tissue and suspend it from a branch near to where you believe its nest is located. Birds have a poor sense of smell and very strong parental instincts, which means they will usually continue caring for their young. However, adult birds are cautious after any type of disturbance and it may take several hours before they approach the nestling. During this period it is essential that humans not approach the nestling. Fledglings are typically fully feathered, with a short tail and wings. They are able to walk, hop and flap, and they may attempt short flights, but are still being cared for by the parents. If you find a fledgling, it should be left alone or at the most placed in a nearby shrub. Keep people and pets away so the parents will continue to care for it until it can fly. Placing fledglings back into nests is typically only a short-term solution, as they will quickly re-emerge. Moving fledglings to entirely new locations is also ineffective, as they are still dependent on their parents for survival and will quickly starve. Why can't I raise the baby bird myself? Raising wild birds in captivity is always a last resort and should only occur when a young bird is known to be injured or orphaned. Although it may seem "safer" to raise young birds in captivity, birds raised without the benefit of learning from their parents only have a minimal chance of survival when released. These are very real hazards and do lead to mortalities; however, all young birds face hazards regardless of whether they live on urban, suburban or wild landscapes. The best thing you can do is to try to reduce hazards wherever possible. Bringing individual baby birds into captivity will not help either its siblings or the many other birds nesting in your neighborhood. As difficult as it may be, often times the best thing you can do is leave a baby bird alone and try to reduce neighborhood hazards. A baby bird may seem helpless and vulnerable, but many do survive even in the most urban of locations. While it may feel safer, removing young birds from the wild usually reduces their chance for survival. So you want me to wait until the bird is injured to bring it to a rehabber? Our hope is that you will be able to help reduce some of the hazards facing baby birds in your neighborhood. This is the best way to not only protect the bird you have found, but also all the wildlife in your neighborhood. Bringing healthy baby birds to a rehabilitation facility to prevent them from being injured makes no more sense than raising healthy human children at a hospital to prevent them from becoming sick. ALWAYS CALL A NJ WILDLIFE BIRD REHABILITATOR FIRST BEFORE TAKING A BIRD OUT OF THE WILD. SEE REHABILITATOR LIST ON HOME PAGE. Owls are some of the earliest birds to fledge. Young owlets leave the nest and begin exploring nearby branches long before they are able to fly. Sometimes a swift gust of wind or a misstep will bring them to the ground. If you find a young owl on the ground, try placing it on the highest nearby branch you can find. They will frequently make their way back up the tree. Some of our parks have large numbers of waterfowl. As a result, female mallards and geese will often nest far from water and then have to lead their young back to the park when they hatch. Ducklings and goslings are precocial, meaning they are able to walk and feed themselves as soon as they hatch. People are often temped to "rescue" goslings and ducklings when they see them traveling near busy roads with their mothers. These well-intentioned interventions usually end badly with the mother spooking and orphaning her young, or with the young scattering and getting run over. It is far more helpful to allow them to proceed as a group and to try and stop traffic for them wherever it is safe to do so. Some ducks found in parks are abandoned domestic ducks. They are discarded Easter pets and from school hatching projects. Tragically, these birds are often imprinted on humans. Releasing domestic ducks into the wild is cruel, illegal and punishable by both fines and jail sentences. Just like cats and dogs, domestic ducks/geese cannot survive on their own. They are killed by predators and cars and will starve to death--bread is not enough to sustain them. In the Winter, domestic ducks/geese dumped in the wild die of thirst and freeze to death on the ice. Don’t allow school hatching projects and don’t get Easter ducklings (or chicks). Be Aware: People and some domestic duck "rescues"/networks claim to help but will take in these ducks and eat them. PetducksrUs Yahoo Group http://pets.groups.yahoo.com/group/petducksrus/ is a reputable group that offers domestic duck care information and may be able to help you place domestics in safe, forever homes. Some of the above information from Portland Audubon Society website.